We are so excited about U By Uniworld, the new river cruise brand designed specifically for millennials and gen-xers (21-45 years of age) by Uniworld Boutique River Cruise Collection. The new brand promises intimate new experiences and active adventures, plus many late nights and overnight stays in select ports. The B (formerly the River Baroness) and the A (formerly the River Ambassador) ships were completely refurbished and updated specifically for U By Uniworld. Sailings will start in 2018 with four, 7-night itineraries in Europe sailing from April thru October, as well as the Christmas markets. Receive $50 per person shipboard credit for booking with us. Itineraries include: 8-Day Germany's Finest from Frankfurt to Regensburg (and reverse) on The A (Main and Danube Rivers). 8-Day Rolling on the Rivers from Amsterdam to Frankfurt (and reverse) on The A (Rhine River). 8-Day The Danube Flow from Regensburg to Budapest (and reverse) on the A (Danube River). 8-Day The Seine Experience, roundtrip Paris on The B (Seine River). Shore trips will involve both organized tours and independent excursions, plus free transportation to city centers, so guests can do as U please.  ​MH Signature Journeys is an independent affiliate of Travel Experts, a Virtuoso Member agency. This affiliation allows us to provide exclusive VIP access, amenities and promotional offers to our clients not available anywhere else. We are a proud member of Cruise Lines International Association (CLIA), the worldwide trade association for cruise lines. We look forward to working with you. Call us today at 302.442.0225 or 800.552.6103 for reservations and information.